The Land Use, Land Use Change, and Forestry (LULUCF) sheet in the Energy Policy Simulator (EPS) handles pollutant emissions and sequestration from land uses, primarily related to forests, including forest set-asides, afforestation/reforestation, avoided deforestation, and forest management. Emissions from agricultural operations are handled in the Industry sector, where Agriculture is considered an industry, and emissions from agriculture (such as methane from enteric fermentation and rice cultivation) are considered process emissions. However, conversion of land from forest to cropland or vice versa is handled in the LULUCF sector. The LULUCF sector is constructed to be relatively flexible because different countries have very different land use challenges. For example, in the U.S., there is no net deforestation, and most existing forests are well-managed. In other countries, deforestation is a major problem. Therefore, most policies are set up to achieve a user-specified potential amount of annual sequestration (or in the case of forest set-asides, potential amount of one-time abatement). The model groups reforestation (planting forests on land that is not forest, but was forest prior to human influence) and afforestation (planting forest on land that was not deforested by humans, but is climatologically able to support a forest). This is because the actions involved in reforestation and afforestation, as well as the resulting sequestration, are similar and can be handled by the same model structure. Change in emissions can be driven by each of three LULUCF policies: afforestation/reforestation, forest set-asides, and improved forest management. The forest set-asides policy reduces timber harvesting by setting aside a portion of the forest land that is regularly harvested for timber in the BAU case, such that timber is never harvested from this land in the policy case. It achieves a particular CO2 abatement in each year based on how much forest was not cut down that year due to the policy. The policy assumes the forest will not be cut down later: the affected land areas will remain forest throughout the rest of the model run. The model only gives credit (change in CO2 emissions) in the one year when a given area of forest would otherwise have been cut down. 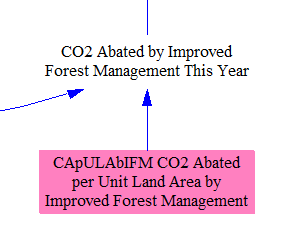 (That is, even though that area of forest continues to not be cut down, year after year, the model only counts the CO2 reductions from that area of forest in the first year when it was not cut down and otherwise would have been cut down.) The model assumes the immediate release of all CO2 from trees that are cut down, even though some of that carbon may remain locked inside the dead wood (e.g. in paper, buildings, furniture, etc.) for a number of years. This can be thought of as converting a given area of “regularly-harvested forest” to “never-harvested forest.” Although the LULUCF sector does not consider leakage (as the Industry sector does), a strong setting for this policy would imply greatly reduced U.S. timber harvesting, which might cause more importation of timber and/or more substitution of other materials for wood in buildings and consumer products. In other sectors in the EPS, we consider cash flows caused by the policies enabled by the user: that is, actual payments of money from one actor to another. In the LULUCF sector, some of the important financial impacts pertain to the value of land, but do not cause specific changes in cash flows, at least until the land is sold (which is not within the model scope, and which may never happen for many government-owned forests). Accordingly, we include a calculation of “lost land value” that is separate from the “cash flow” calculations for the LULUCF sector. Finally, we simply sum these sources of change in land value to find the total loss in land value from LULUCF policies. Forest set-asides (conversion of regularly-harvested forest to never-harvested forest) involve simply refraining from taking action, so we consider it to have no direct cash flow impacts. (It saves some money that would have been spent on timber harvesting operations, but it has second-order impacts that reduce revenue for timber producers. We don’t track second-order impacts in the model, and it would be misleading to report that reducing timber harvesting saves money for timber producers.) Instead, we handle the economic effects of forest set-asides in the “Lost Land Value” section above. The other two policies: afforestation/reforestation and improved forest management, do involve payments from one model actor to another, and these changes in cash flow are tracked in this part of the model.